If you’re a high schooler, you should include your Education section underneath your well-written career objective. The structure of your resume will vary depending on work experience (or lack thereof) and how active you are as a student. If you are a high schooler with no work experience, then writing a strong Education section is your best bet. Employers will honor a strong work ethic and good grades, which will guarantee you an interview in the future. Since this student has no real experience in the field, they created a “Major Achievements” section, which is an appendage to the Education section above it. This is where the student details the projects or clubs they participated in and their main responsibilities. This student, who is striving to get their foot in the door as a graphic designer, demonstrates their initiative and motivation in the example above. They not only secured advertising for their school newspaper, they saved the organization money; in their next bullet point, they also mentioned that they formatted the advertising to fit around the contents of the page. This shows their depth of understanding about an industry they are itching to get into. Keep in mind that your main objective is to convince an employer that you are a trustworthy, hard-working individual with the capacity to handle an entry-level position. If you have no work experience, then you should follow the same format. Anything that demonstrates your enthusiasm and work ethic will do; think of clubs, organizations, extracurricular activities or even volunteer work that you have participated in that could count as major achievements. If you’re a high schooler with work experience, then you should place your Education section underneath your work experience. With this format, your emphasis should be on writing a strong career objective and a detailed “Professional Experience” section. This high schooler’s Education section is briefer than that of our previous applicant, who has no work experience. Notice how she only included her expected graduation date and two leadership roles as opposed to a comprehensive list detailing her coursework, GPA, etc. This is due to her extensive work experience, which will always prove more valuable than academic achievements. If you have work experience, then you should place more emphasis on it. Your Education section, while still important, should be placed under professional experience. The key here is to expound upon relevant achievements and knowledge you have gleaned while on the job. Employers will acknowledge your age and initiative, which will land you an interview, if not the job. If you want additional help writing your professional experience section, read our how-to guide. If you are a college student or recent graduate, your Education section should always go under your Career Objective. With or without experience, your status as a student (or graduate) will still be of interest to employers. If you don’t have work experience, you shouldn’t worry; you still have a good chance of landing an interview. The student in the example below doesn’t have any experience, but still made a solid resume that will catch an employer’s attention. You might also be worried that you don’t have enough substantial material to fill up a page. 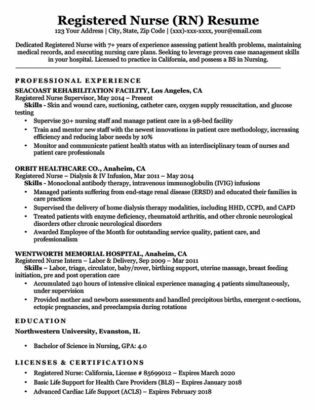 Again, the applicant managed to flesh out their resume without any prior real world experience. The truth is, you have many tools at your disposal; it’s just a matter of learning how to use them. Besides writing a killer career objective, this applicant made sure to beef up their Education section by mentioning their expected graduation date, GPA, relevant coursework, awards and honors and extracurricular activities. This not only takes up space, it bolsters their credibility. Notice how this education example also includes the same sections as the high school student, but with more detail. They include more relevant courses, quantify the number of competitors in the competition, and include the dates that participated in organizations. We see that our applicant quantified their experience, which not only tells employers what their role was, but how effective they were. They go on to list noteworthy achievements, treating their college projects like industry campaigns. If you weren’t as active as the above candidate, then you should draw on coursework, clubs, or anything outside of your college experience that may contribute to your efforts. This sense of focused language speaks to their credit by emphasizing their enthusiasm, professionalism, tact, and aptitude for the position at hand. You should shoot for a similar resume. If you are an active student, you should have ample material to incorporate throughout your resume body. If you weren’t as active as the above candidate, then you should draw on coursework (major assignments, essays, etc. ), clubs, or anything outside of your college experience that may contribute to your efforts. If you still don’t have much to work with, you can start inquiring about opportunities in your area that may lead to the kind of experience you need. 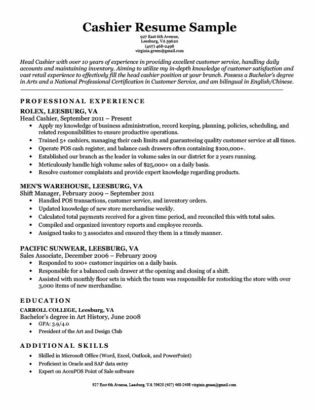 If you are a college student with work experience, then your resume should follow a slightly different format. 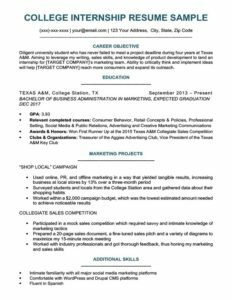 Look over our entry-level accounting resume example below to get an idea of how to structure yours. In this example, we see the applicant has internship experience, so their Education section only mentions items of importance like relevant coursework and GPA; they also placed it underneath their Career Objective. If you have work or internship experience, you should follow this format. Eventually, after you have accrued solid work experience, you can place your Education section at the bottom of your resume body; until then, supplement your hands-on experience with academic muscle. If you have work experience, we recommend you follow a similar format. Include any clubs or extracurricular activities that will contribute to your resume in any way; you want to portray yourself as a hard-working and reliable candidate. Place special emphasis on your “Professional Experience” section by adding results-oriented achievements. For more help writing an effective “Professional Experience” section, see our resume writing guide. Following the Education section tips above will give you an edge on the competition. If you would like more help writing your resume, then you should visit our comprehensive resume writing guide.